West Virginia has made significant contributions to this nation throughout its history. Whether you're talking about women, nature, government, or even rules about walking a pet, you'll find 15 fun facts below about the Mountain State where "mountaineers are always free." The first Mother's Day was observed at Andrews Church in Grafton, West Virginia on May 10, 1908. Mothers have been celebrated in one way or another since early Greek and Roman times. However, in this country, most people agree that formal efforts started during the Civil War (1861-65) by Ann Reeves Jarvis. Mainly started by Reeves as an attempt to unify families and promote reconciliation after the war, other noted contributors to Mother's Day as we know it are Juliet Calhoun Blakely, Mary Towles Sasseen, and Frank Hering. Although there wasn't sufficient written evidence to support West Virginia having the largest sycamore in the world, the state can certainly claim having had the largest tree in the state's history. Known as the Webster Sycamore and located near Webster Springs, the 112-foot tall tree was declared the largest of its species in the United States. Unfortunately, it was felled in 2010 due to age (500 years) and due to damages from arson. Considered a national historic landmark, Grave Creek Mound in Moundsville, West Virginia, is considered the nation's oldest and largest Native American burial grounds. Early North American inhabitants known as Mound Builders constructed such conical mounds for religious purposes and burial sites. Free mail delivery had been offered in major cities around the U.S. prior to 1891, but the first rural free delivery (RFD) mail service occurred in Charles Town on Oct. 6, 1896 as an experiment to see how feasible this type of service was and it became the largest and most expensive endeavor by the U.S. Postal Service in its history. John S. Gallaher published The Ladies Garland, one of the first newspapers in the U.S. that was written for women, during the Victorian Period. When her husband died in the middle of his legislative term, Minnie Buckingham Harper, took his seat by unanimous appointment. She was the first African American woman to serve in any legislature in the U.S., showing the growing interest of women and African Americans in politics. Many notable people have been born in West Virginia from all different categories, like Terry Bowden, athletics, Jennings Randolph, politics, Homer Hickam, science, T. D. Jakes, religion, Don Knotts and Kathy Mattea, entertainment, and Alex Schoenbaum, business. Many states are known for their contribution to agriculture, but West Virginia has been home to two varieties of apples—the Grimes Golden apple and the Golden Delicious apple, which became the official state fruit in 1995. With tensions high and divisions in political belief frequent in the country during the Civil War, West Virginia was voted into existence by popular vote and is one of only two states formed during that time. Some Southern sympathizers still refer to the state as Western Virginia. The state's name was originally Kanawha and the capital was in Wheeling, but after a couple back-and-forth changes, that was changed to West Virginia and the capital permanently moved to Charleston in 1885. 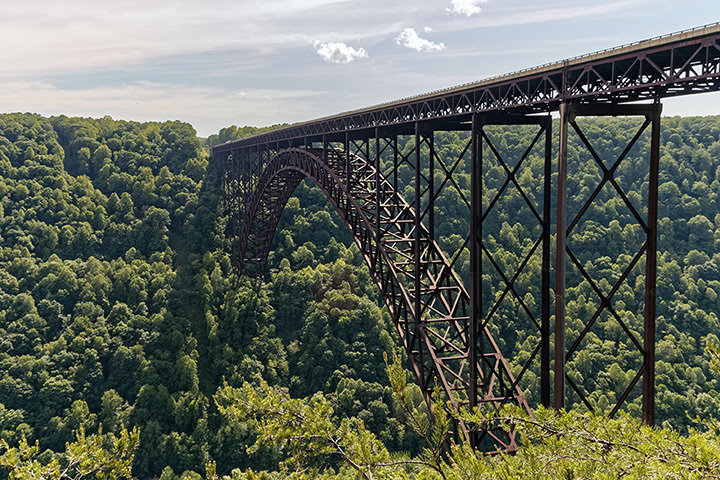 Fayetteville, West Virginia, is home to the longest steel arch bridge in the Western Hemisphere, stretching over 3,000 feet over the New River Gorge. The bridge is also one of the most popular locations for photographs and is viewed by many as a work of art and not just functional. The secret is out! A massive underground fallout shelter was built in the 1950s beneath the popular hot springs resort for the U. S. Congress in case of nuclear attack. The bunker could accommodate over 1,000 people for at least 60 days. That part of the resort in White Sulphur Springs, West Virginia, is now open for public tours. Originally a settlement by the Jackson family in the 1800s, the property had a grist mill and saw mill, a blacksmith's shop, and was even used as a hospital for a short time during the Civil War. It was the site of the first 4-H camp in the world in 1921 when it was deeded to West Virginia University.